KEYS TO THE SPORTSCAR ~ Catboating Colorado’s Classics. 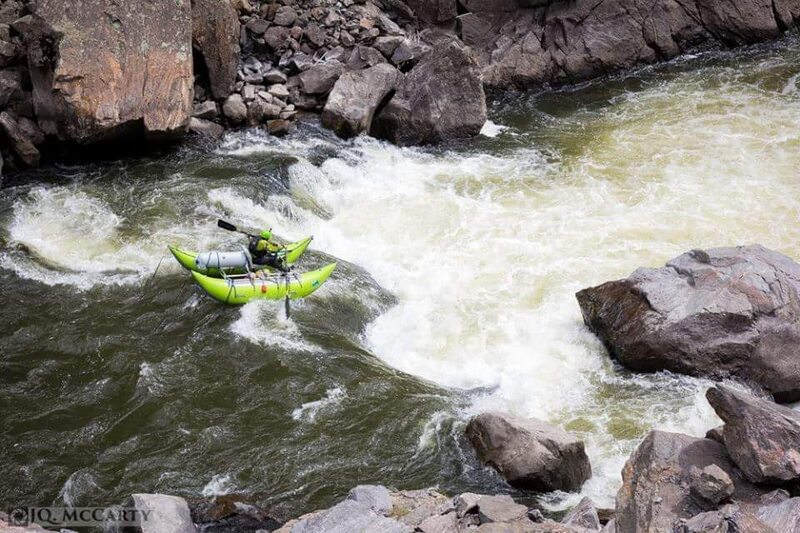 by Tony Glassman | DBP MAGAZINE ONLINE The World's Best Free Whitewater Publication. The 2016 rafting season started like most before, with some overnight trips and a few day stretches trying to bag high water on the rise with my AIRE 156R oar rig. 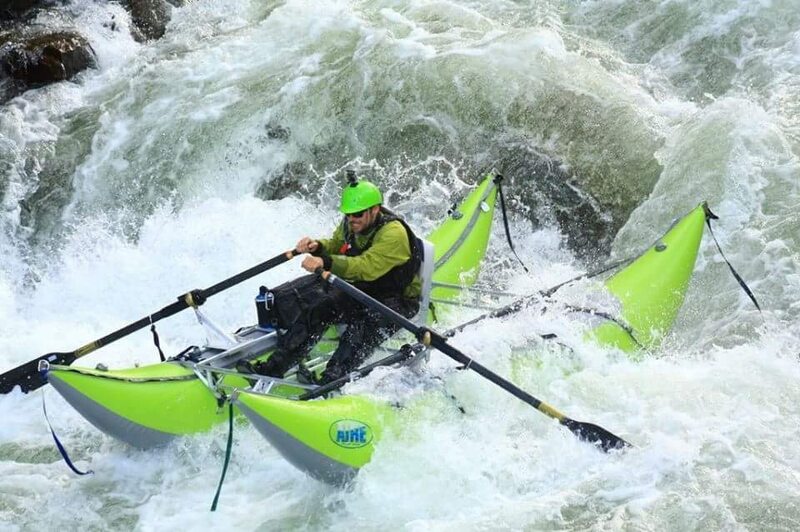 I live in Vail, Colorado, which in my personal opinion is an overlooked whitewater mecca. There’s class IV water rolling right through town, class IV water off the first exit west of Vail, class V creeks in every direction, not to mention the dozen or so rivers all under a couple hour drive. I took advantage of my home base this spring and nearly every night, with friends or not, I would launch on the Upper Eagle or Dowd Chute by 6pm and take out under the rising moon by 9pm. After a few Dowd Chutes, a tight Class IV/V rocket rapid filled with holes and laterals, I was starting to realize maybe a 16’ round boat isn’t the best tool for day stretches. A couple weeks into the season I made a deal on a 12’9” Jack’s Plastic Cataraft. I was down some spare oars and on a homie payment plan through the summer, but once hitting the water in the new cat I quickly realized I had just been given the keys to the sports car. Suddenly I could track anywhere I wanted on the river, catch kayaker eddies, surf waves, and crush every hole in sight. The addiction grew quickly and before I knew it June was here and I was pushing 30 consecutive days of class IV whitewater. Down Chute at 5’ is spicy! Straight down the barrel crushing every hole and lateral in sight! 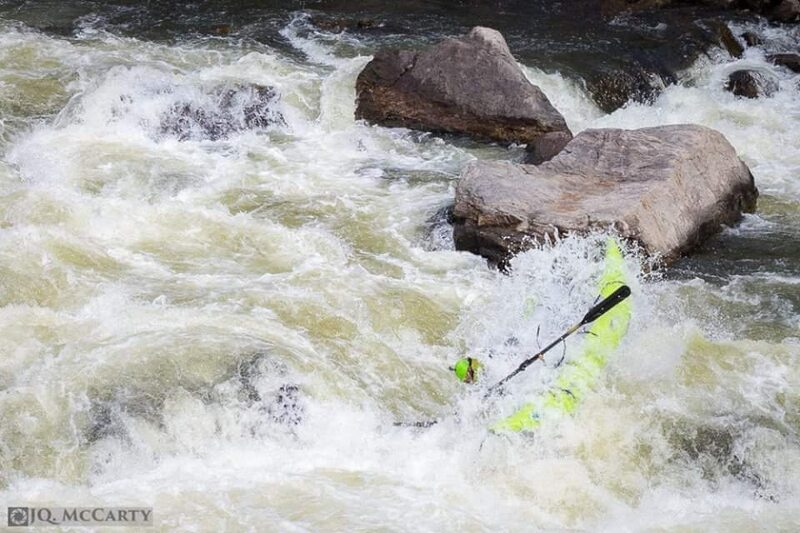 The big prize of the spring was taking an oar rig down Gore Creek, a class IV run through Vail. There are a few tour companies running paddle boats and a plethora of local kayakers on this run, but desolate of private boaters. I couldn’t find any beta on oar rigs running the stretch, and everyone I talked to who had run Gore Creek told me to stay out. Well who could resist all that temptation? I spent a full day scouting and memorizing all the rapids, and picked my markers to let me know where I was as I entered each rapid. I sent out messages to pretty much anyone in Colorado I had ever boated with and no one would go with me. I did however find a friend willing to ride his longboard on the bike path next to the class IV sections with a throw bag. That’s pretty much set safety right? 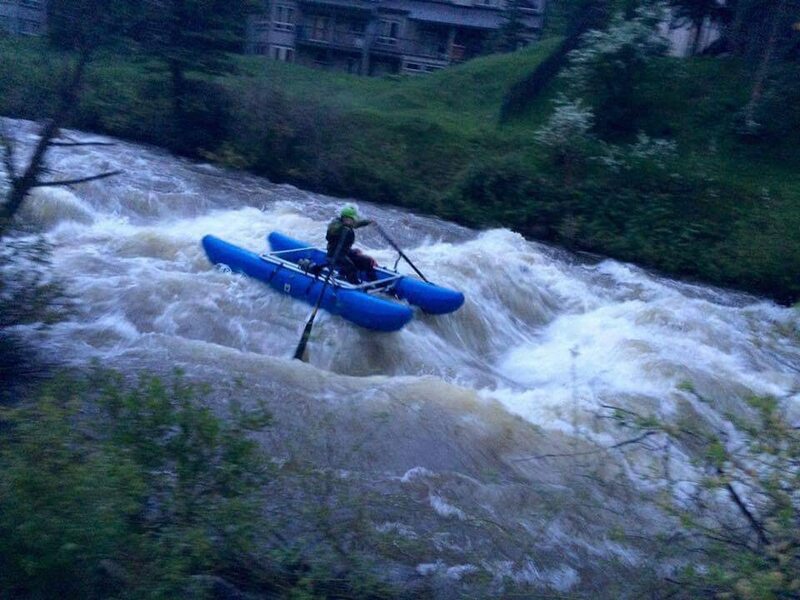 I put on the creek solo at 6pm in East Vail with the river running at what I thought was 950cfs and on the rise. The next day I came to find out I was checking the wrong gauge and the creek was actually at 1100cfs when I put on, and 1250cfs by the time I took out. The rise in water would normally be welcomed but this particular stretch has at least a dozen low bridges and pipes. Knowing this I took the back off of my seat prior so I could lay straight back looking at the rear of my frame… and the bottom of bridges rushing by inches from my face. Entering the first class IV rapid, I couldn’t seem to find my marker, some tree branches hanging over river left. As I crushed into the first hole in the rapid I looked left and saw that my tree branch marker was under about a foot of water. Nothing like realizing where a rapid is as you are already through the entrance. Making what felt like one thousand moves I got through the first two rapids. 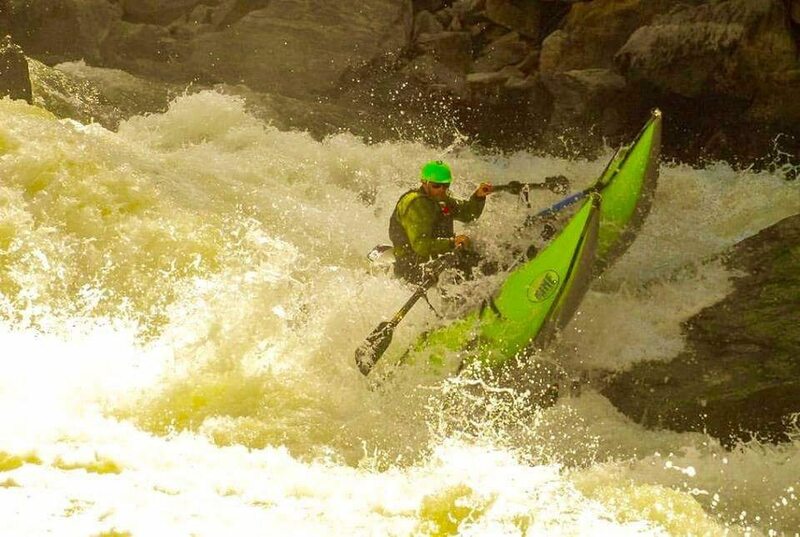 By the time I had made it through the third class IV rapid it was pouring rain, becoming a little too dark to see, and I couldn’t mentally handle clipping another bridge with my PFD. I pulled out a few miles upstream of the take out in a park and waited for my shuttle to find me. On the shore of the creek I was literally jumping up and down with joy. I knew there was more of this stretch to finish but I also knew now it was totally crushable in the cat (which to this point I still haven’t heard of anyone else ever taking an oar rig of any kind down this stretch). I finished the creek about a week later when the water had come down some (on the correct gauge). I was lucky to snag five solo runs down the creek before it quickly disappeared. Rowing through the third hole in the Tennis Court rapid. Photo by Mike Schranz longboard safety extraordinare. At this point I was beyond hooked on Cat boats and was ready to step up to a class V rig. So I sold our old camper and bought a 12’ Wave Destroyer with a Class V Adventure frame. After 5 Gore Creeks, 27 Upper Eagles and 15 Dowd Chutes, I was ready to find more stretches. The only problem was the water was dropping and I wanted to fire it up now more than ever. I decided to really tune up my cat skills low water or not and take all the high adventures lines whenever possible. First on the list was Slaughter House Falls, in a little place called Assspen. The main feature to this class IV/V run is a large drop into a hole. It’s a pretty sporty spot to start cutting teeth on drops, and beyond cool watching people downriver disappear under the horizon line. The rest of the run is primarily large boulder dodging with some moves more technical than others. After a few successful laps on Slaughter House, I ran laps on Clear Creek and Cross Mountain Gorge. Stoked after crushing the last hole in Outer Limits on Clear Creek. Doing my best to drop into a hole and avoid the undercut wall in my way on Cross Mountain Gorge. Just when we all thought the season was wrapping up Granite, Colorado was forecast to get 4 inches of rain in two days. 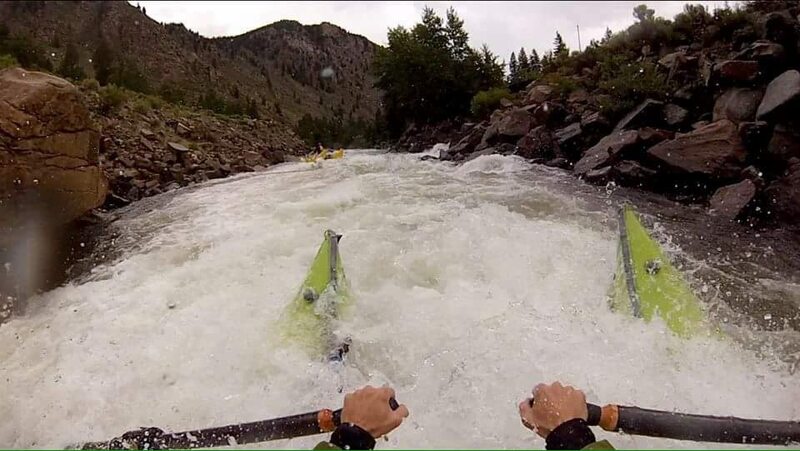 Pine Creek and the Numbers are quintessential Colorado IV/V Whitewater runs north of Buena Vista in Granite. I called my friend Richard, a 65 year old double decade cat boater who had been mentoring me on the cats over the summer. I met Richard at the put in to the Dowd Chute early in the spring and ended up running several great stretches with him this summer. Richard was stoked for the weather forecast and to get up to Pine Creek. We met the last day of the storm which had brought the level from 550cfs to 850cfs. Pine Creek is a fast shot through a tight section of river surrounded and filled with blast rock. There are 3 large holes to hit perfect and then some fun class IV moves. We had so much fun crushing Pine Creek that Richard and I decided to camp and run a second lap the following day. The water came down to 650cfs overnight and was less violent than the previous day, but still a blast firing up the holes. The Numbers comes directly after Pine Creek and is a class III/IV section with lots of fun moves around giant boulders. We shared some victory beers at the take out and discussed running Gore Canyon a class V late season run Richard had swore off 4 years prior. He said we’d talk about it and I replied that I would be swimming laps at the pool waiting on his call. Keep your tips up in the Pine Creek hole! Finally late season had arrived and I was ready for the step up your game “prove yourself” run in Colorado, Gore Canyon. 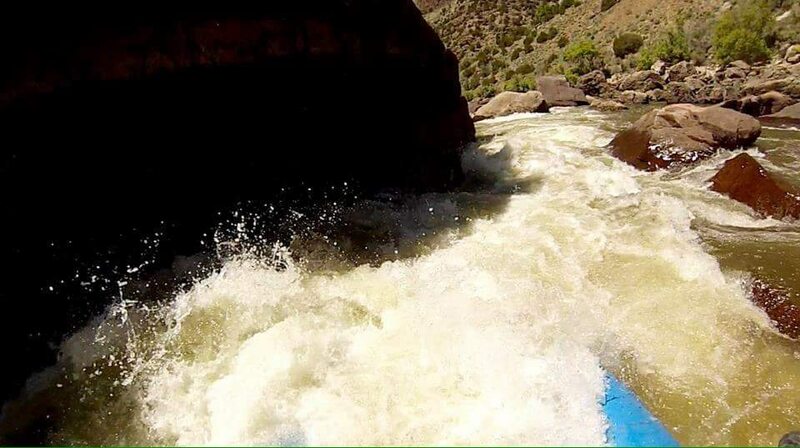 The Gore Canyon is a very technical class IV/V run with several drops, keeper holes, pushy water, blast rock everywhere, and a long history of eating oar rigs. I was lucky to meet another cat boater through an email stream and we made plans to hit the run that weekend. I arrived about an hour early as to have plenty of time to check every last piece of gear I was bringing for the day. Brian, the cat boater I met through the email showed up right on time and we were off. The row into the canyon is through about 3 miles of lake water and at times reminded me of approaching the monster rapids of the Grand Canyon. Rowing the flat water I continually thought about keeping a calm mind and bringing everything that I learned all summer together for this one run. Brian and I geared up above the start of the rapids and began our way down. We both made it through the first class IV rapid, Applesauce, and approached Gore Rapid, the crux class V of the run. Gore Rapid begins with a large hole drop into a class V boulder garden containing a monster blast boulder known as Indecision rock, a raft magnet of a day ruining beast. Looking at the post Indo rock swim we decided as there were only two of us the smart choice was to make a quick portage through a couple boulder slots at the entrance and only run the lower half of the rapid. The portage went smooth and we got back on the water and were greeted with two back to back class IV rapids, Scissors and Pyrite. We luckily slicked both lines and began nervously rowing our way to Tunnel Falls, the second class V rapid of the run. Tunnel Falls is a drop into a large hole that is known for flipping a ton of rafts. We made a quick scout and then Brian charged first into the frothy white ahead. As soon as he went over the horizon I saw his cat fly straight up and down across the river without him. “Oh Sh*t!” was my immediate response. I knew I had to stick this drop in case Brian needed help. A few more “Oh Sh*t’s” and I was in the bottom pool grey side down. Brian had recovered his cat and had an enormous smile on his face. Sometimes swims are entertaining, sometimes. Tunnel Falls class V rock boof to typewriter. Toilet Bowl, our next class IV rapid with a class V keeper hole, was next on the hit list for the day. I was told that if I was caught in the swirling hole to abandon ship and swim away. That was a first. Luckily we both landed our cats in the seam where the two holes on either side of a small tongue collide and pushed on. With one more class IV rapid, Kirshbaum’s, left directly below, we made our way down river. Brian crushed the entire rapid which is about a mile long, while I skirted by with some cat tip stands and a load of luck. I couldn’t believe what had just taken place. 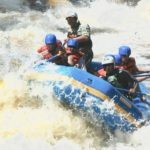 An entire summer’s worth of rafting excitement all in one day. I was lucky to make four more descents the following week, one of which running safety at Toilet Bowl for Gore Fest, and one more run at lower water. 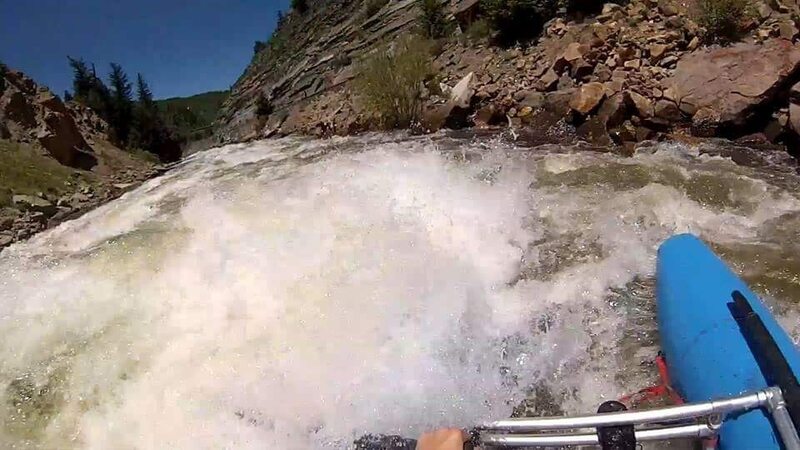 After six runs down the canyon and one Wallace in Toilet Bowl, I would say Gore Canyon is truly a place for any whitewater enthusiast to see at least once. After 12 seasons rafting, this year I found a brand new love for the river and also met an incredible amount of great people to crush with. The rafting community is tight knit but arms open so I’ll hopefully not have too many solo runs next year! Now with 69 days of class IV/V rafting and the season winding down, it’s time to get back to some desert overnighters and wait for the snow to pile up for next season’s run off. The main thing the river showed me this summer on and off the water was to commit yourself to whatever makes you feel best and just go with it. One Love, One River. You only get to run it blind once!